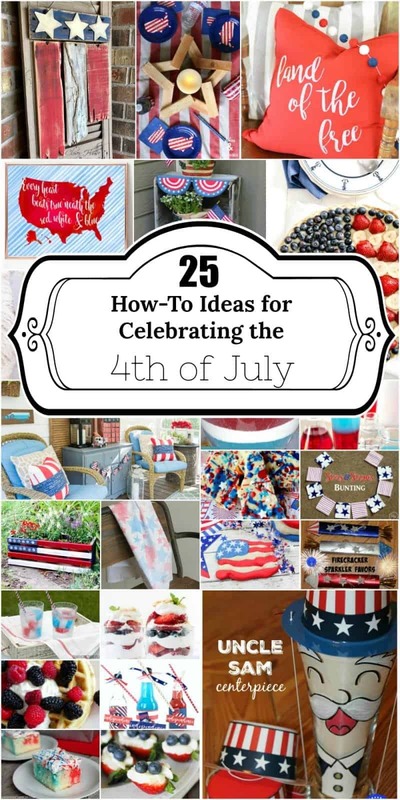 Bring on the red, white, and beautiful blue with this collection of 25 Ways to Celebrate the 4th of July. You are going to love this round-up. But the fun doesn’t stop there! Scroll down for and leave me a comment for a chance to win a $100 Visa Gift Card– all month long! Each comment you leave me on my blog posts this month (July) will be entered to win a $100 Visa Gift Card. The fine print: one comment per day, July 2017 posts only. Leave me a comment at any blog post this month to be entered to win a $100 Visa Gift Card! You can enter on every post during the month of July to increase your chances of winning. Thanks so much for featuring my waffle recipe! Have a great 4th! Wow lots of fun 4th ideas! THANK YOU for featuring my uncle sam centerpiece! happy 4th to you and yours! ??? I like the DIY Flag Planter from The Scrap Shoppe Blog. These are all so cute. I love the 4th of July! I love the patriotic play dough! Great way to get kids into the holiday. What type of camera do you use for pictures? Or is the editing program I should be asking about? They are so clear and crisp!